If you enjoy connecting with nature, this room will delight you. 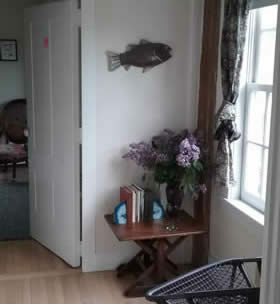 Otter is a sizable room at Cornwall Orchards Bed & Breakfast with a simple maple headboard queen bed and enough floor space for yoga in the morning. Get cozy in this comfortable habitat surrounded by soft furnishings, objects, and art that evoke nature and the Earth’s beauty. You may hear an owl or the coyotes at night from any of our rooms. If you need to check-in with work or feel like playing a game, you have a comfortable chair and Wi-Fi. 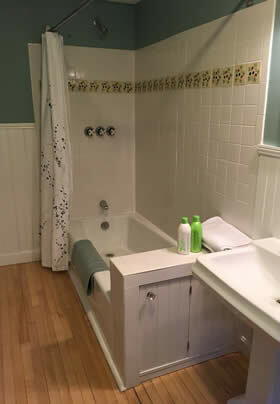 Otter has a brightly painted adjoining private bath with tub and shower. Guests love the privacy of the vestibule—set up like a miniature sitting room — that separates this room from the living room.